New Patient Information Form: Provides TJC with your address, contact information, and insurance information. Please bring your insurance card(s) with you. Patient Authorization Form: Allows TJC access to any pertinent medical records for your treatment. Also authorizes billing on our behalf. Patient Intake Questionnaire: Provides TJC with your medical and surgical history. Patient Privacy Information (HIPAA):The HIPAA Privacy Rule, which protects the privacy of individually identifiable health information, and the confidentiality provisions of the Patient Safety Rule, helps protect identifiable information being used to analyze patient safety events and improve patient safety. Please review the provisions followed at our office. 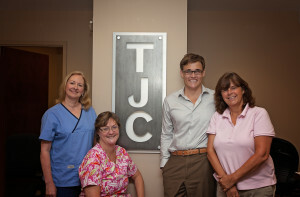 At Total Joint Care, we strive to provide each patient with concierge care. As part of our concierge care approach, every patient meets with the physician, Dr. Steve Struble. We look forward to having you as our patient. Please call our office to make an appointment with Dr. Struble.